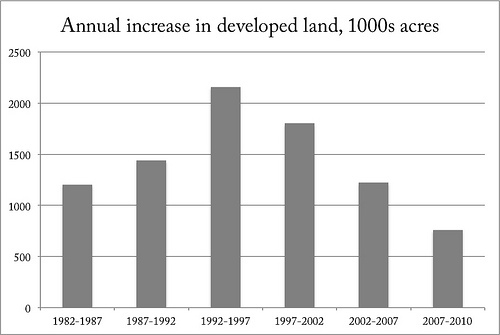 USDA figures show that sprawl has been losing momentum for a long time. When exactly was the point when American sprawl stopped accelerating and started to slow down? It’s tempting to point to dramatic recent events like the housing crisis and the great recession. It’s interesting that the slowdown in sprawl, like the slowdown in mall construction, presaged “peak car.” The directionality might be backwards: the 1980s cessation of massive freeway construction may have pushed many metro areas into some version of Marchetti’s Wall, whose daily-travel-time maximum creates a geometric limit for autocentric growth at the edge. Edge Cities, by relocating commercial uses into the inner suburbs, could only extend the outward trend so far; with a few notable examples, attempts at building Edge Cities in outer-ring suburbs have largely failed, since there’s no meaningful centrality amidst the undifferentiated masses of one-acre lots. Second-generation Edge Cities rarely thrived, because without new beltways there just wasn’t the population base to feed them. Elsewhere on the Network today: Where the Sidewalk Starts offers a tips for reducing speeding in residential neighborhoods. Strong Towns applauds the Oregon Department of Transportation, one of the first state DOTs to admit it doesn’t have the money to continue expanding highways. And the Transportationist explains why shopping trips are declining rapidly.